Whenever there has been damage through the layers of the skin a scar will develop. This damage can be through a cut/laceration, burn or acne. Wounds must go through a healing process. Initially healed wounds will appear red and raised, and this can be present for up to 6 months. From 6-18 months the scar matures and usually becomes flatter and less red. Sometimes though the scar can remain obvious. can happen to anyone. It generally means that the wound has healed in unfavourable circumstances, such as: a long time to heal, infection present or too much tension. is very common and is when the scar grows outside the area of injury. It occurs in genetically susceptible individuals. Scars always tend to shorten and form a straight line. When there is a scar across a concave surface (e.g. palm of the hand) or near to some mobile elastic skin (eg lower eyelid) then the scar can form a CONTRACTURE and distort tissue or prevent movement. 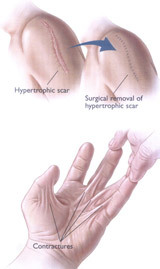 There are a number of ways of treating scars including taping the scar, applying silicone sheets/gel, steroid injections/cream, resurfacing, surgical revision. It is important to seek the advice of an expert for determining the best method of treatment.